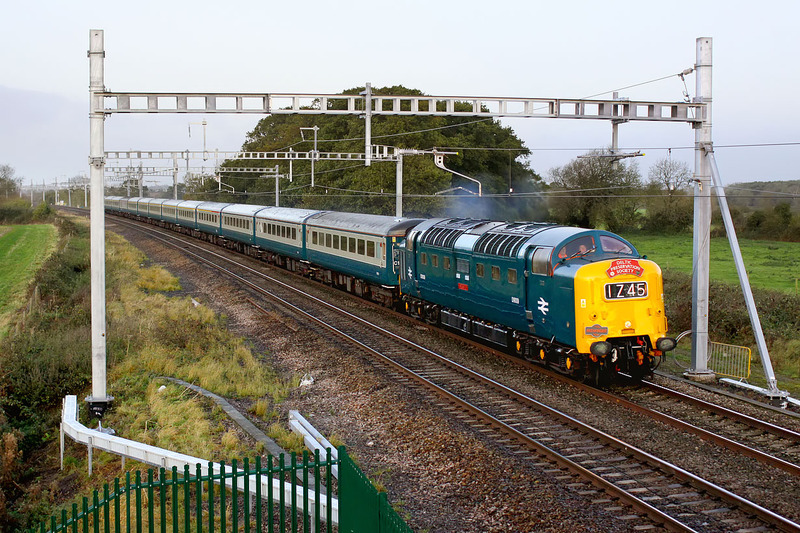 D9009 Alycidon passes Uffington on 21 October 2017 with the Pathfinder Tours 1Z45 04:31 Burton-on-Trent to Swanage 'Swanage Belle' railtour. This was running one minute early, which was very unfortunate. If it had been running one minute late it would have passed in the very first of the morning's (admittedly weak) sunshine, just a mere twenty minutes after sunrise. This was especially unfortunate, as it would have been clear of the shadows of both the footbridge, and the tree in the field on the left. Note that only the down line has so far been wired here.